Israeli police on Tuesday assaulted and harassed Muslim worshipers at the Al-Aqsa Mosque compound, using the pretext of a fire in the compound as the excuse for their invasion of the holy site, according to Palestinian News Agency Wafa. A fire was discovered in one of the police stations in the compound on Tuesday, and the worshipers inside the building were assaulted by Israeli police, who forcefully pushed them out. Witnesses described a large police force, stationed at the gates of the mosque compound, which entered the compound and attacked many of the people inside praying. Worshipers were violently pushed away from the main gate, the Lion’s Gate (Bab al-Asbat), as they arrived for the evening prayer, one of Islam’s five daily prayers. 8 Palestinian worshipers were detained by police, including 3 women, with many others assaulted. The Palestinian Red Crescent ambulance said it transported 4 worshipers to the hospital for injuries related to the assault. The Israeli police also reportedly attacked their medical crew, and obstructed their movement. Israeli police alleged that worshipers set fire to the police station at the sacred site. But Palestinian worshipers refuted this claim, stating that the fire was more likely started by police, to use it as a pretense for closing the Lion’s Gate. 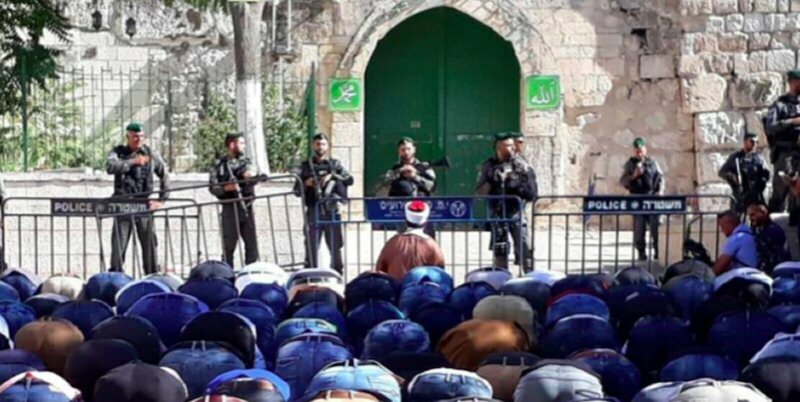 The Lion’s Gate closure meant that all gates to the Muslim holy site were closed, restricting Palestinian Muslims’ freedom of worship. Because of the closure of the mosque, prayers were held outside the gates, while Israeli police stood guarding the doors. It is important to note that the Lion’s Gate, and Bab al-Rhama prayer area, was closed by Israeli authorities 16 years ago, and was re-opened by Palestinians 3 weeks ago. Palestinian President Mahmoud Abbas reportedly contacted the Hashemite King of Jordan, to help diffuse the Israeli aggression. Jordan’s Royal family funds the Islamic Waqf (Endowment), which controls and manages the property. President Abbas denounced the Israeli aggression, and warned of grave consequences for its actions against Palestinians and other worshipers. Visit Quds News Network for videos and pictures of the scene, here. The Middle East Monitor posted this video on Twitter of the Israeli forces attacking and clashing with the worshipers.